I shared in my last post that we recently attended our provincial homeschool convention. It was held in Saskatoon, Saskatchewan and put on by the Saskatchewan Home Based Educators (SHBE). Saskatchewan Home Based Educators (SHBE) is the official voice of home-based educators in Saskatchewan. We assist in creating a positive social network and a positive political environment for all those who choose home-based education. We also provide supportive, social and instructional resources for our members. If you homeschool in Saskatchewan and don't already have a SHBE membership, I highly recommend you get one :) The SHBE board does a lot for us! They are our voice when there needs to be discussion with the government. They are also a great source of encouragement and wisdom! As for the convention, my husband and I have been attending the homeschool convention ever since our oldest was only one year old. That first year I did not really want to go. I felt silly because we were not officially homeschooling yet. But because my husband had been homeschooled, and he knows me so well, he knew that I needed to go before we were officially homeschooling so I would have time to prepare for it. I am so glad he did convince me to go that year! If I had waited until our children were school age I would have been completely overwhelmed! As it was, I will never forget my first sight of the curriculum fair! I could not believe how many choices there were for curriculums, books and other resources! At that moment, I did not even realize that there was another whole ballroom full of more curriculum booths! And that is still a very small amount of the choices that are available to us as homeschoolers! My other exciting purchase for this year was a new spelling program. Princess is just not enjoying spelling and although a new spelling program was not on my list of things to buy on the weekend, I could not stop thinking about it. When I woke up Saturday morning I decided that I should at least look at spelling programs and see what kind of spelling programs are available. I went to the curriculum fair early, with half an hour before the first morning workshop, but when it was time for the first workshop, I just had no peace about Princess' spelling, so I continued to look at spelling programs for another hour! Finally, I found All About Spelling. I have tried to make spelling fun for Princess, with lots of hands-on spelling practice, like spelling with Play-Doh or in rice. She use to like doing those things, but now she tells me she would rather just write the words out five times each, even though she hates printing! I let her practice by writing out her spelling words each day, but at the end of the week, she still could not spell all her words, so it did not seem to be working for her. More and more I am starting to see that Princess is very visual, and not as hands-on as her mother is. I am a very hands-on learner, as my other children seem to be too. But I have been trying to learn about learning styles and how I can make sure I am teaching in a way that speaks to my children's own learning styles and strengths. 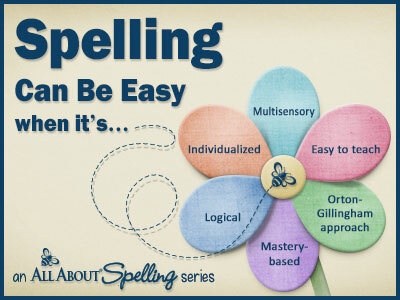 When I found All About Spelling I chose it because it is visual learning. The student can see the letter tiles and learn how to put them together. It is also hands-on, with moving the tiles around, but not as much as spelling with play-doh. It is also auditory because you say the sounds out loud as you move the tiles around. Using all learning styles is the best way to optimize learning, so this seems wonderful! Plus, the program recommends starting at the beginning, even with an advanced student. At this point I have to admit that I was a little worried about how horrible her spelling is and I liked the idea of starting over with her to make sure she has a chance to catch on to things that we may have missed along the way. After our first day of using it, Princess had gone through the first three lessons and she was beaming at how much she had accomplished! She told me that she likes our new way of doing spelling much better :) Because it is easy for her, she is going through it quickly, but I have noticed that the program does cover some things that we missed, so she is learning new things too. Along with buying the lesson book and student's pack, we stopped at Staples on the way home from convention and I bought a magnetic white board for our new spelling lessons. This way I don't have to set it back up every day and I can just keep all the tiles on the board so it is ready for the next lesson. We did buy a few other things, like The Fallacy Detective that my husband picked up and The Way They Learn by Cynthia Tobia that I snagged for $2 at the Used Books Sale. Both Little Man and Munchkin got their own A Reason for Handwriting books to start on too. (Munchkin is flying through hers! She loves printing!) I also ordered next year's math - Teaching Textbooks 4 for Princess and the next levels in Math-U-See for our two youngest. I love the free shipping I get at convention! Do you shop at your homeschool convention? Do you go with a list and stick to it, or do you like to browse and see what kind of goodies you can find? You might also be interested in this post from Frugal Homeschool Family: 7 Tips for Sticking to Your Budget at a Homeschool Convention. Good for you! I can't even imagine being in charge of the homeschool convention! Our committee always does such a great job and I can only imagine the time and effort that goes into running it! I will definitely pray for you!